Labrador Tea - Toxic or Tonic? 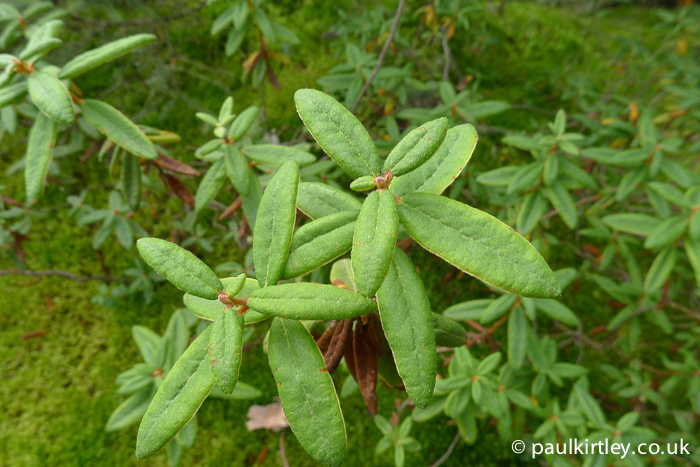 Labrador tea is the name given to three closely related Rhododendron species. The plants have a circumpolar distribution in the northern hemisphere and have a long history of being used by the native peoples of the Arctic and sub-Arctic. Other names for these plants include swamp tea, bog tea, marsh tea, muskeg tea, and Hudson’s Bay tea. Although there is some variation in exact habitat preferred by each species, many of these alternative names give a good indication of the local environment in which they like to grow and to which they are suited. Like many members of the Heath Family, Ericaceae, to which these plants belong, they like acidic conditions. In particular, peaty soil, cold bogs, as well as coniferous forest, particularly spruce forest. 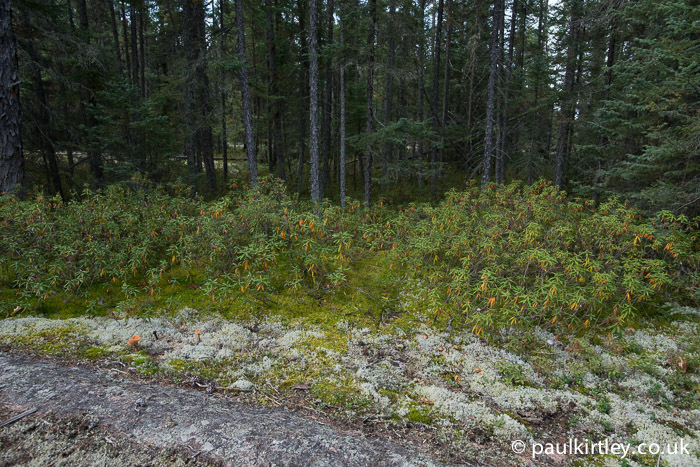 The name Hudson’s Bay tea is not just an indication of the geographic location where you find this plant. It is more a reference to its use by the Hudson’s Bay Company, both as a product it sold as well as a tea used by its employees in the north of Canada. The Hudson’s Bay Company imported the dried plants into London as a beverage tea under the name weesukapuka. Wish-a-capucca and weesukapuka are phonetic variants of the Chipewyan word for this plant. The Eastern Cree had a similar word for the plant wesukipukosu, meaning “bitter herbs”. As well as being drunk as a tea on its own, Labrador tea was also known to be mixed with other herbs such as wild mint, rose hips, sweetened with sugar or honey or used to augment imported black tea supplies. Bog Labrador tea Rhododendron groenlandicum (previously Ledum groenlandicum) occurs across the Arctic and sub-Arctic from Alaska to Greenland and used widely as a beverage. The closely related plants, Northern Labrador tea, a.k.a. Marsh Labrador tea, Rhododendron tomentosum, (previously known as Ledum palustre), and Western Labrador tea, a.k.a Glandular Labrador tea, or trapper’s tea, Rhododendron neoglandulosum, (previously known as Ledum glandulosum) were also used in a similar fashion. Bog Labrador tea, Rhododendron groenlandicum is the most common and widespread of these species in North America and as such is often referred to as Labrador tea without modification to the name or distinction from the other two species. Rhododendron neoglandulosum is limited to a much more westerly distribution in North America. Both R. groenlandicum and R neoglandulosum are absent from Eurasia. Only Rhododendron tomentosum has a Eurasian distribution but it overlaps distribution with Rhododendron groenlandicum in Greenland. While native peoples of the north certainly used these as beverage teas, there is some debate about whether or not the usage as a beverage pre-dated the arrival of Western Europeans, as in some quarters the concept of beverage teas is thought to have arrived with the Europeans. What is sure, however, is that these plants were used medicinally. R. groenlandicum was one of the most widely used medicinal herbs by the First Nations of Canada. And these uses certainly pre-dated contact with Europeans. 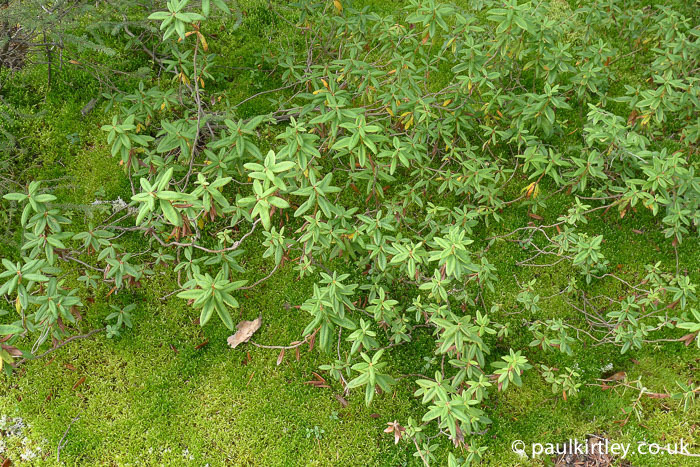 Moreover, Northern Labrador tea, R. tomentosum, also occurs as a rare species in Scotland and parts of Europe, including Germany (“sumpfporst”) where, in the 18th Century, it was added to beer to make it more intoxicating. It’s also found more commonly in Fennoscandia (“skvattram” in Swedish; “finnmarkspors” in Norwegian; “suopursu” in Finnish) and there it was noted as a medicinal plant in folk tradition, including in the writings of Linnaeus. An infusion of R. groenlandicum was used as a general tonic by some tribes. Labrador tea is now known to have a high vitamin C content but it was for a long time known to prevent scurvy. A common use of R. groenlandicum was a decoction to treat colds, sore throats, chest problems or fevers. It was also used to treat stomach upsets and diarrhoea, as smaller amounts seemed to have a calming effect even though larger quantities are recorded as being laxative. Teas made of the plants are also diuretic. The leaves of Rhododendron groenlandicum, traditionally used for medicine as well as beverages. Photo: Paul Kirtley. Small amounts were considered a stimulant, whereas large amounts were said to cause drowsiness. Some natives would chew a few leaves as a stimulant. R. groenlandicum , R. tomentosum and R. neoglandulosum are now known to contain narcotic compounds and toxins, although in varying amounts, R. groenlandicum seeming to have lower levels than the other two. Interestingly, Inupiat people considered Marsh Labrador tea, R. tomentosum a poisonous plant. Glandular Labrador tea, R. neoglandulosum is poisonous to livestock, especially sheep. Externally, crushed or powdered leaves were used on burns, either directly or mixed with grease. Decoctions of the plants were also used to wash burns and on dry, itchy or chapped skin and on sores. More latterly, alcohol extracts of the leaves have been used to treat infestations and fungal skin diseases. Many Rhododendrons and other members of the family Ericaceae contain grayanotoxins, including some of the Labrador tea species. Poisoning from grayanotoxins is rarely fatal in humans but in concentration can cause hallucinogenic effects. Poisoning from these toxins more frequently manifests itself as “mad honey disease”, where honey made from the nectar of some plant species such as Rhododendron ponticum or Andromeda polifolia is consumed. The toxin of greater potential concern in consuming Labrador tea is ledol, a poisonous terpene that can cause cramps, paralysis and delirium. These are the signs and symptoms of poisoning from excessive consumption of R. tomentosum and R. neoglandulosum in particular and likely why some tribes considered them poisonous. From the differing views of different First Nations, it also seems possible that their view of the toxicity of the respective herbs has some mapping to the varying toxicity of a given species in different areas. Indeed, research has shown that the main constituents of the essential oils found in Labrador tea vary considerably, dependent not only on the particular species but also the habitat and season of harvesting. For example studies in Lithuania and Russia have shown that the proportion of ledol in the essential oil from R. tomentosum varied by a factor of ten, i.e. from 3.9% ledol to 30.5% ledol. 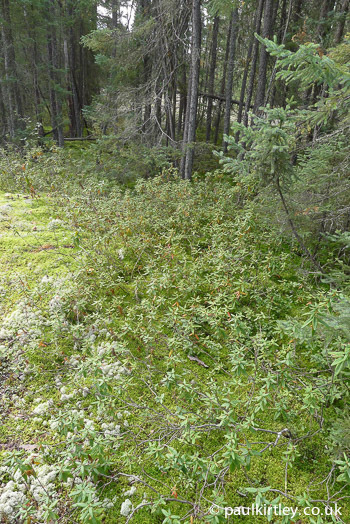 By contrast R. groenlandicum collected in the region of Chicoutimi, Quebec contained no detectable ledol. That said, it is now considered that excessive boiling of any of the species of Labrador tean releases more ledol if present in the sample used. This is the reason the long brew-times and strong brews of old are now considered hazardous and to be avoided. Equally, frequent or abundant consumption of Labrador tea should be avoided to minimise the chance of overconsumption of ledol. Research published in the June 2015 Journal of the Science of Food and Agriculture supports this. Research suggests that drinking no more than one cup of Labrador tea per day is the maximum to obtain the digestive, calmative and vitamin C benefits but to avoid any potential side effects. This species is a rather untidy looking, evergreen shrub, with some Rhododendron characteristics which are common to other species with which you may already be familiar. It’s quite a small plant compared to some Rhododendrons though, with the single stems 30cm to 1.5 metre (1 to 4 foot) in height. Rhododendron groenlandicum plants, known as Bog Labrador Tea or just Labrador Tea. Manioba, Canada. Photo: Paul Kirtley. The shape and character of the leaves are simple, ovate-lanceolate and leathery, to about 4cm (1.5-2.0”) long. The leaves are mid- to dark green with smooth, untoothed edges and blunt tips. 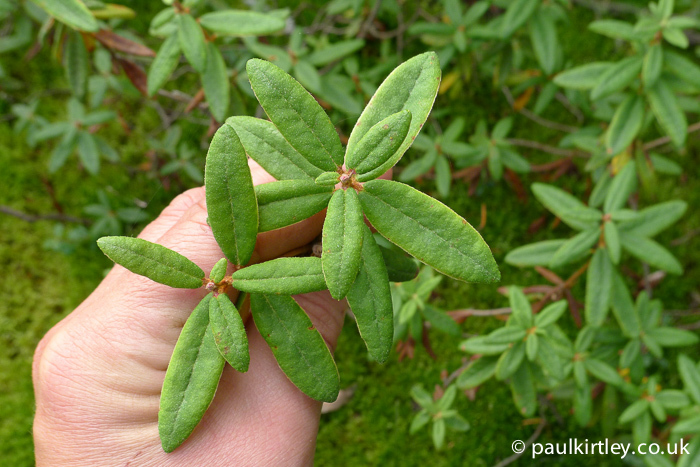 The leaves of Labrador tea, Rhododendron groenlandicum, Manitoba, Canada. Photo: Paul Kirtley. The leaf margins are turned down and under. The underside of the leaf is distinctly furry, with a wooly matt of rusty brown hairs on mature leaves (lighter colour on younger leaves). These are key identification features in differentiating this species from others. When the plant is crushed or bruised, due to the essential oils, it is distinctly aromatic, not unpleasant. To my nose it is somewhat reminiscent of pines, eucaluptus or rosemary. The plant flowers May to July with white flowers in terminal clusters of 10-35 flowers. Each creamy white flower has radial symmetry, has five petals and between five and seven long stamens. Click here for an image of the flowers. By contrast, the leaves of R. tomentosum are similar but narrower, smaller and straighter-edged. There are two species of Ericaceae which should not be mistaken for Labrador tea, as both are highly poisonous. Kalmia angustifolia commonly known as Sheep Laurel or Lambkill and Kalmia latifolia, commonly known as Mountain Laurel or Montaine Laurel are the species in question. Both have evergreen, leathery, ovate, toothless leaves similar to those of Labrador tea. Their leaves don’t, however, have rust-coloured furry undersides like R. groenlandicum. So this is the key thing to check if you are in doubt. Another northern plant that should be avoided in this context is Andromeda polifolia, mentioned above in the context of honey poisoning from grayanotoxins, and commonly referred to as bog rosemary. This plant is a dwarf shrub with flowers quite different from Labrador tea but some people think it has superficially similar looking leaves. Bog rosemary’s leaves are smooth and light coloured on the underside. They also have no real smell. The rust-coloured felt on the underside of R. groenlandicum is again a key differentiating identification feature, combined with its aromatic smell. Remember that R. groenlandicum is an evergreen plant, so you can collect the leaves year-round. But there are lots of opinions on when its best to collect the leaves from a flavour perspective. The leaves used to prepare Labrador tea can be fresh or dried. Dried leaves can be used at a later date, either at home or on the trail. The consensus seems to be to keep the dried leaves whole until close to the point of use, when they should be cut up finely as per a loose leaf tea. An old-time way of making a strong tea was to have leaves brewing in a pot or kettle on the back of the stove, hearth or fire for hours if not days to make a really strong brew. This is now not recommended at all (see above). In terms of the time of picking, some people prefer the new Spring leaves, some say the flavour is best when the plant is in flower, some prefer the Autumn or Winter leaves. Yet, others prefer to make a tea from the flowers themselves (steep for 10 minutes maximum). 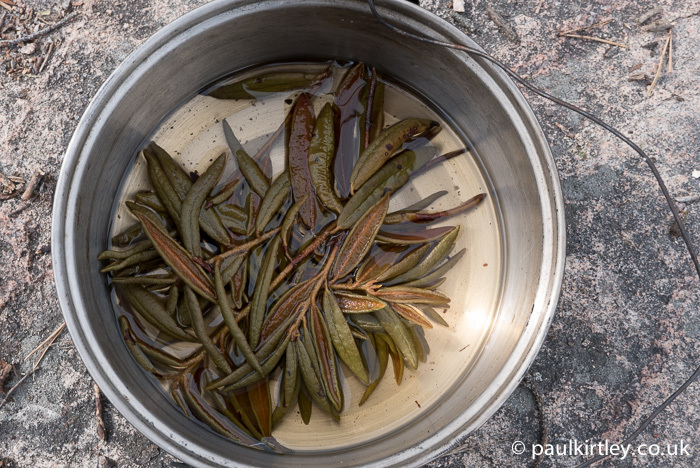 Making Labrador tea is something I like to do occasionally while on back country canoe trips in Canada. I tend to use fresh leaves picked close to the time of use. I pick a handful of leaves and add them to some already hot water in a pot over the campfire. I let them brew for 5 minutes maximum and then take the brew off the heat and serve. Unsweetened, I tend to be quite satisfied by just a small cup. It definitely seems to have a pick-me-up effect at these small dosages. This is a very good, very useful piece of scholarship. One point that you do not touch on is how to distinguish R. groenlandicum from R. neoglandulosum. Budd’s Flora of the Canadian Prairie Provinces says that R. glandulosum (sic) is “glandular-dotted below”. 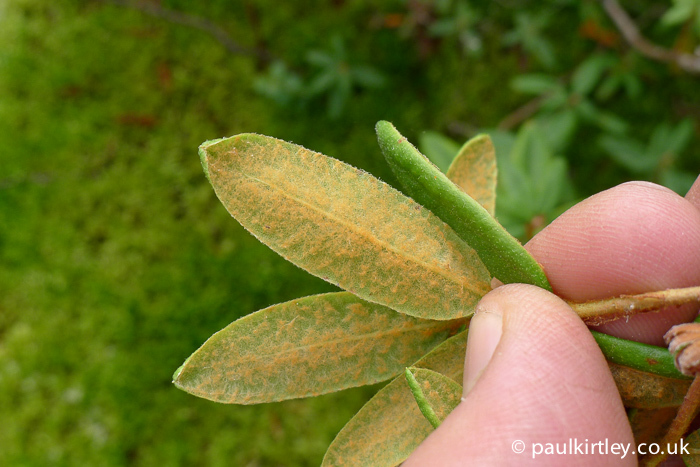 The Labrador Tea that I am familiar with (which I assume is R. neoglandulosum) has small orange bumps on the bottom of the leaves, in addition to orange fuzz. I have in the past drunk it without any ill effects, but will now be more cautious. It is good to see an article that looks at the historic usage and folklore alongside more rational analysis. I worry when people recomend the medicinal use of flora based purely on traditional ‘knowledge’, without checking if that knowledge actually stands up to the more rigorous methodologies we have at our disposal nowadays. Thanks for a particularly interesting and informative article. Thanks for your comment. I’m glad you picked up on this point regarding “old” or “traditional” knowledge vs modern scientific enquiry and analysis of phytochemicals. We can still add to and modify what has been practiced or used in the past to have the most informed view of these plants ever. The synthesis of the old and new knowledge is very powerful. Thanks again for your comment – much appreciated. Thanks so much for this helpful and specific information. I really appreciated your discussion of the medicinal properties of Labrador tea as well as its potential toxicity. Hi Louise and welcome. Thanks for your comments. I’m glad you found this useful. I really enjoyed your article. Labrador Tea is abundant around here although I am not sure which species we have. I had recently been told it was toxic so have been trying to find more information and your page is very helpful. I was wondering if maybe you know whether or not the smoke from burning Labrador Tea is also toxic if inhaled? Hi Amanda, thanks for your comments on my article. I’m glad you found it useful. My wife and I never boil the Labrador tea, (it’s northern Canada, R.groenlandium), but we steep it in boiled water for 5 or 10 minutes and drink a cup or two. With mint, it is quite tasty. Left to cool in the fridge, it make a most delicious summer drink. Thanks for the comments Marcel. Thanks for this article. I have been looking at different instructions for the method of brewing. I am going to go with steeping for 5 – 10 minutes rather than the boiling but I am not finding a consensus on the number of dried leaves that should be used per cup. Would you be able to advise? I think a couple of handfuls of leaves in about half a litre/1 pint of water seems to provide (to me) a decent flavour. I hope this helps. Warm regards, Paul.